Donald Trump celebrated reaching a 50 per cent approval rating on Thursday night just hours after attending George H.W. Bush’s funeral. The jubilant tweet, posted at 10:32pm last night, celebrated the results of the latest survey from Rasmussen Reports – which put him four points ahead of Barack Obama at the same point in his term. 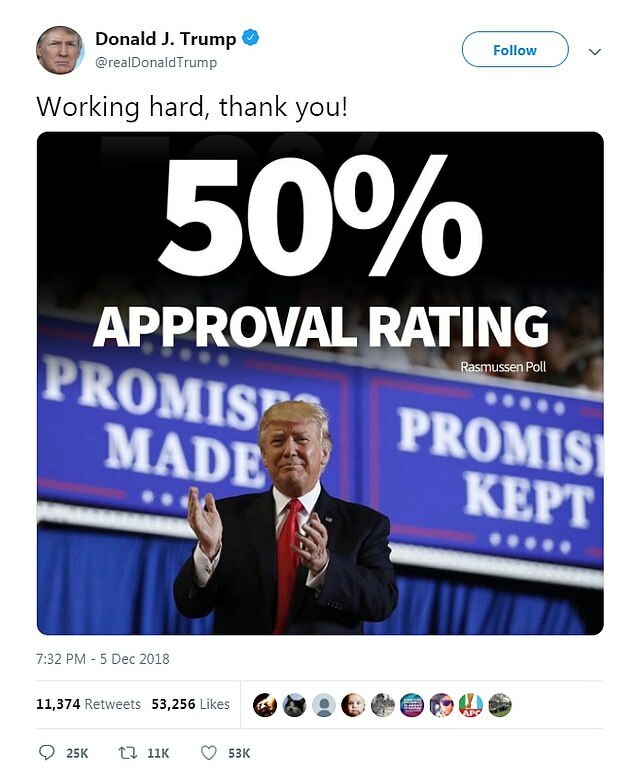 The US President, who previously recorded ratings as low as 38 per cent, tweeted ‘Working hard, thank you!’ alongside a large blue graphic. However, critics soon blasted the reliability of the Rasmussen results, which have previously been much more favourable to Trump than other sources. According to the Rasmussen poll, 50 per cent of U.S. Voters approve of President Trump’s job performance, while 48 per cent disapprove. The latest figures include 35 per cent who strongly approve of the way Trump is performing and 40 per cent who strongly disapprove. But other polls for the same period by YouGov, Ipsos and Gallup put Trump’s rating at between 40 and 43 per cent. While poll website FiveThirtyEight which tracks all polls conducted on the President’s approval set his aggregate score at just 42 per cent on Wednesday. Trump is extremely proud of his approval ratings and has previously goaded other world leaders, including French President Emmanuel Macron, over theirs. After Macron suggested the creation of a European army last month, Trump tweeted that he suffered from a ‘very low rating’. ‘The problem is that Emmanuel suffers from a very low Approval Rating in France… he was just trying to get to another subject,’ Trump said. The news comes as another Rasmussen survey claims 54 per cent of U.S. Voters think Trump is likely to be reelected in 2020. Rasmussen conducts daily surveys via telephone of 500 likely voters, and has a 2.5 per cent margin for error. 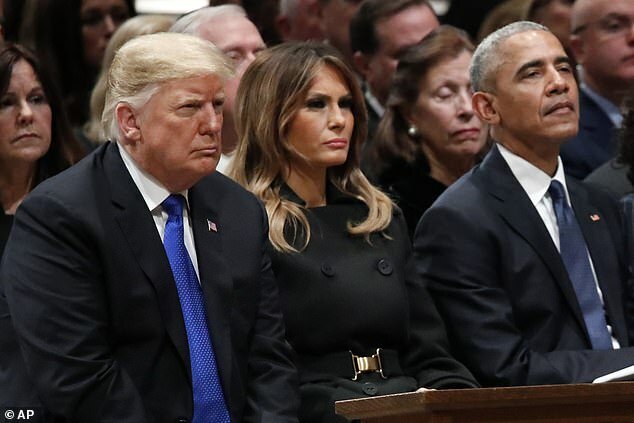 Earlier on Wednesday Trump was slated after leaving the funeral of 41st President George H.W. Bush early – before the casket had even left the church.